As a kid going to college in Portland, Oregon, one of my favorite hangouts was Powell's Bookstore. If you're not familiar with the famous mega-store it's now arguably the largest new and used bookstore in the U.S. (some say the Strand in NYC is larger). Of course it has grown much larger since I was in college in '68, but it was always my dream to one day have one of my books sold in this paragon of bibliophilia. So my childhood dreams have come true! Rizzoli Press, the publishers of "Independently Animated", has scored me a prestigious signing at Powell's. I'm out in Oregon this summer to present "Idiots and Angels" at the Clinton St. Cinema and also see my family, so it's a perfect opportunity to make an appearance and signing at Powell's. 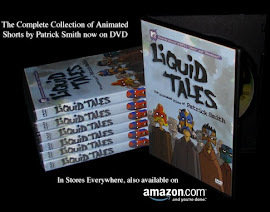 I did a bunch of local publicity for the signing and the "I & A" premier. As I set up for the presentation I was worried no one would show up, but one hour before my start time the seats began to fill up – in fact they had to go to storage to get more seats. Eventually it was standing room only; I think they even turned away a bunch of people. The audience was a great mix of fans, family, book clubs and the curious. I projected 3 of my films: "The Cow Who Wanted to be a Hamburger", Weird Al Yankovic's "TMZ" and the pencil test from "Cheatin' ". Then I showed selected pieces of art from the opus book and talked about how these particular drawings were instrumental to my successful career. After the great applause I made drawings in the books and gave every customer a film clip from my feature, "Idiots and Angels". The signing went on until they had to kick me out because the store was closing. If you ever find yourself in Portland be sure to check out Powell's, the greatest bookstore in the world! 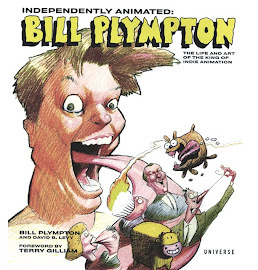 You may find a few signed copies of "Independently Animated: Bill Plympton" still on the shelf – but don't delay, the stock won't last long.